Today I am going to review the Adidas switch pro racket. 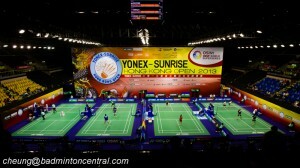 Adidas is a newcomer to the badminton equipment scene. 2+ years in the planning Adidas is finally ready to reveal their badminton lineup to the world. The Adidas smart series of badminton rackets is characterized by their ability to add a weight strip at the top of the frame, transforming the balance point of the racket at an instance. The Switch Pro is part of the Smart Series of rackets made by Adidas. There are in total 2 rackets in the series. The switch pro is both heavier and more head heavy than its younger sibling, the Switch Tour. The Smart Series of rackets by Adidas is another design that slightly departs from the traditional Adidas badminton design, in a refreshing way. 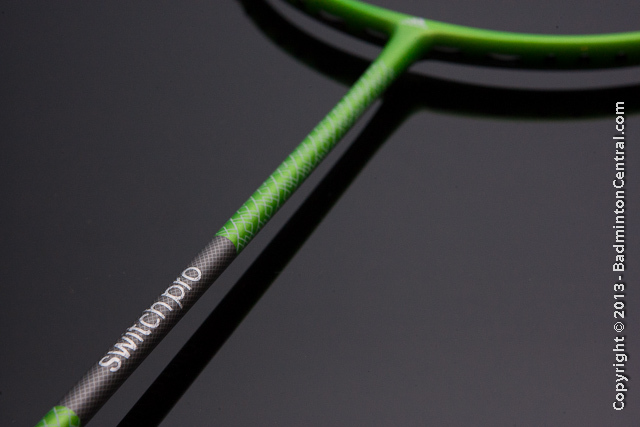 The switch pro has a duo tone design where each face of the racket has its down main dominant color. One side is mainly green, but if you flip the racket to the other face, it is mostly grey. I was genuinely surprised when I first unbagged the racket as I was expecting only one of the two colors. The dominant color on each side both fades to a silvery gray color at the top. The main body is playfully decorated with a light and subtle criss-cross pattern that blends into the main color, a slight departure from the serious and bold look of the other 3 series. The soul of the Switch Pro is clearly the ability to change swing weight of the racket on the fly. An Adidas patented design allows the addition and removal of a weight strip at the top of the frame. Prior to Adidas there have been attempts at swingweight customization but they come in the form of lead tape or weight strip that must be applied before stringing. Adidas has come up with a way to do it with very little effort and can be added or removed at any time after the racket is strung. This is designed for the player who wishes to during a game to change the specs of the racket at an instance without changing the racket. The weight strip comes in 3 different weight classes, 1 gram, 2 grams and 3 grams. To attach, a lip on both edges of the strip tightly holds onto a matching groove at the top of the Switch Pro frame. Having examined and experimented with the attachment and detachment of the weight strip, i found it very secure and the mechanism very precise. The groove/channel on the top of the frame is stiff while the plastic of the strip clips in very securely. I suspect to achieve such precision some sort of machining was performed on the frame to create a groove as certainly that is not achievable with molding alone. I am sure everyone will be curious what the weight strip do to the weight and balance. Before applying the weight strip, my switch pro has dry spec of 86.90 grams and balance point of 291mm from the handle base. With the 2 grams weight strip attached, it is 88.95 grams with a balance point of 300mm. 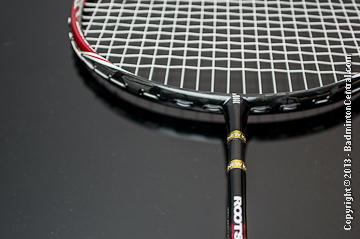 As a result, the Switch Prois the Adidas racket with the highest balance point. The balance point will be even higher with a 3 grams strip but I didn’t have it in hand to try. While an innovative design, the switch pro is designed for a specific target audience. Most enthusiast badminton player and especially advanced level badminton players will have at least a few rackets in their bag. Something like the Switch Pro will be an novel idea to them but it is more likely they will have different racket for their doubles and singles need. 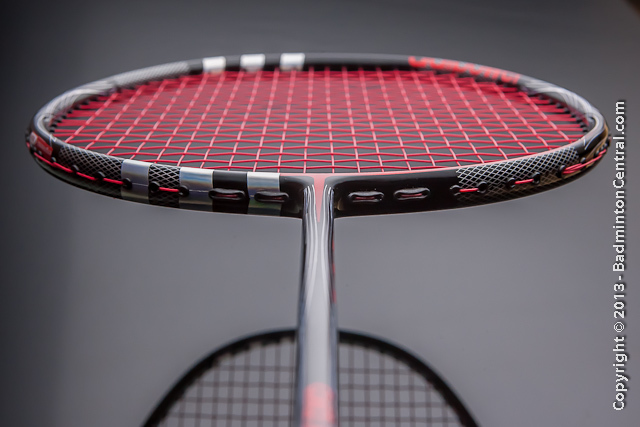 Thus the switch pro is priced to target to the amateur player who prefer to only own one racket and have it transform to different balances on the fly. I strung the Switch Pro with my standard test string Ashaway Zymax 62 at a tension of 23×25.3lbs. The stringing process is very straight forward being a standard 76 stringing pattern. The weight strip needs to be removed during the stringing process and replaced afterwards. The frame feels medium stiff and there is only slight frame movement at this moderate tension. The most interesting part about the Switch Pro is to compare the racket with and without the weight strip applied. The intriguing part is that there is a significant difference between the two. While it doesn’t make it into 2 completely different rackets, the characteristics do change quite a bit. I will first review the racket on its own without the 2g weight applied, and then I will update it with it later on in this review. On dry swing, the Switch Pro matches the feel of an all around racket, the swing is substantial but not overly so like the adipower pro, but definitely more weighty than the adizero pro. After adding the weight, however, give the racket a very distinctive head heavy balance. Someone who has held a 3U VT80/VTZF will be familiar with the feeling with extra weight at the head. Driving and counterattack with the racket is not hard, decently maneuverable without the weight. The feel of the shaft is medium stiff and lively, though not as crisp and solid as the adizero/adipower pro cousins. I found that I prefer the extra stability provided after the weight strip is installed, directional control is slightly enhanced with a slight sacrifice in speed. Clears are quite effortless with the Switch Pro, which is something that didn’t surprise as the medium stiff shaft is a good speed match with medium strength shots like the clear. What was surprising is that a defensive clear under pressure was easier than i thought, a quick snap of the wrist is all it takes to hit the shuttle from behind my back deep to the opponent’s baseline. This is obviously designed for the beginning to intermediate who can use the extra help from the racket. Adding in the weigh strip makes little difference in clear other than a more solid kick. Smash is decent, but again, i prefer the more solid feel of the adipower/adizero pro for real hard smashing. I do prefer the Switch Pro with the weight strip for smashing as that provided more momentum on the down swing, without the strip it is ok but maybe overpower for the truly strong player. And that bring me to the weight strip again. I was initially skeptical that such a simple clip-on mechanism can provide enough holding power for the 2 gram weight. I was reassured that Adidas has given this to an international player to test and even he cannot shake it off. My own testing has confirmed that claim. Even after I hit the frame a few times, the weight strip stayed intact without any sign of it coming off. Defense and control is decent. There is an extra bit of dwell time detected by not as much so as the Precision 88. I played quite a few games of mixed doubles where the majority of the shots are control. There is a slight hint of overdampening that i was able to feel, resulting in a slight detached feel. Most beginners will prefer that feeling but personally I want to feel 100% of all the shots I hit. The Switch Pro is a very innovative racket by Adidas which is well suited for badminton players who are intermediate player and like to experiment and modify the swing weight of the racket for different occasion. While its performance doesn’t match its elder cousins, as I was told this is marketed at the appropriate medium price point which will make it affordable to beginners/intermediate, esp for students. The patented design is really cool and the overall feel of the racket is excellent.